Population change and demographic transition over time including natural increase, fertility rate, life expectancy, population structure and dependency ratios. Detailed examples of two or more contrasting countries. This usually refers to the "Demographic Transition Model" but may be used to simply mean changes in population numbers and structure over time. The number of live births per thousand people in one year. The number of deaths per thousand people in one year. The increase or decrease in population per thousand people in a year calculated by subtracting the CDR from the CBR. Natural increase occurs when there birth rate is higher than the death rate; natural decrease occurs when the death rate is higher than the birth rate. It is usually expressed per thousand but may also be converted to a percentage. The number of live births per 1,000 females of childbearing age (between the ages of 15-44 years) in a given year. ​The average number of children that would be born per woman if all women lived to the end of their childbearing years and bore children according to a given fertility rate at each age. TFR is a more direct measure of the level of fertility than the crude birth rate, since it refers to births per woman. The average number of years to which a person can be expected to live from birth. 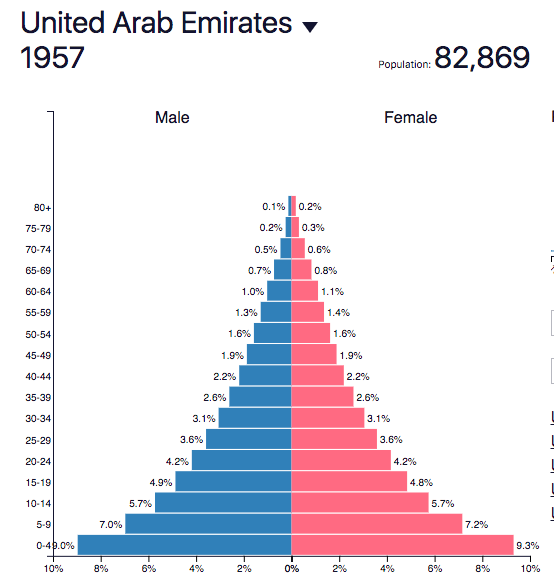 The composition of a population according to the proportion of males and females of different age groups. This is the time that will be taken for the population of a given area to double in size. It is calculated using the "rule of 70" which means that we divide 70 by the rate of natural increase expressed as a percentage. This explains why population growth can continue even when birth rates/fertility rates fall in populations with a youthful structure. It occurs because a large number of young people will reach maturity and therefore the rate of births will continue to exceed the number deaths even with falling overall fertility. The very simple video below should help! 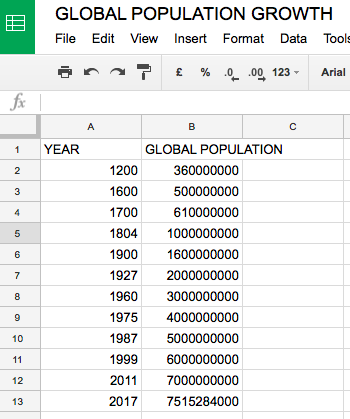 Use the google sheets file to graph and describe the increase in global population over time. What does your answer to Q2 suggest about the rate of increase? 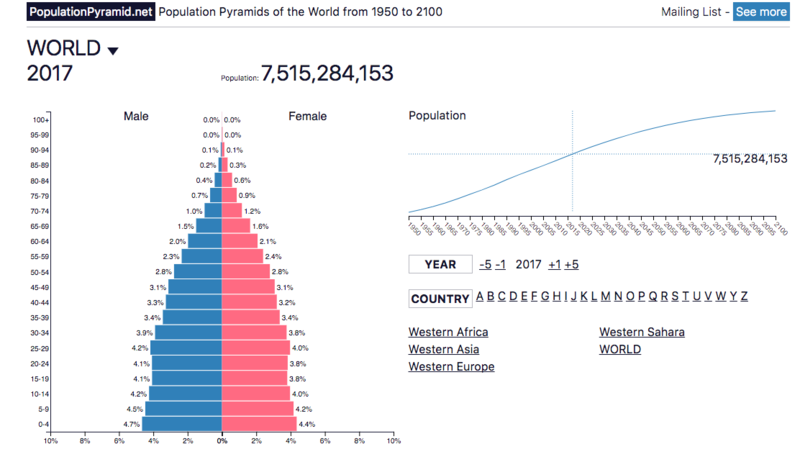 Use the World Bank data below to explore changes in the total population of China and Niger over the same time period. 1) Overall world data - use the graph tab for this. Remember to identify trends, be specific with data and identify any anomalies. 2) How has fertility changed spatially on a global scale? Use the map and the timeline to examine and describe this. What change can you identify within each continent/region over this period? Use the data bank function to explore the data by examining North America, EU, Southern Asia, Sub-Saharan Africa, East Asia and Pacific. 1) Overall world patterns. Focus on key aspect of the pyramids: width of base (indication birth rates), steepness of the pyramid (can give clues about death rates but also show the effects of events eg epidemics, changes in access to contraception, wars, migrations - national scale). 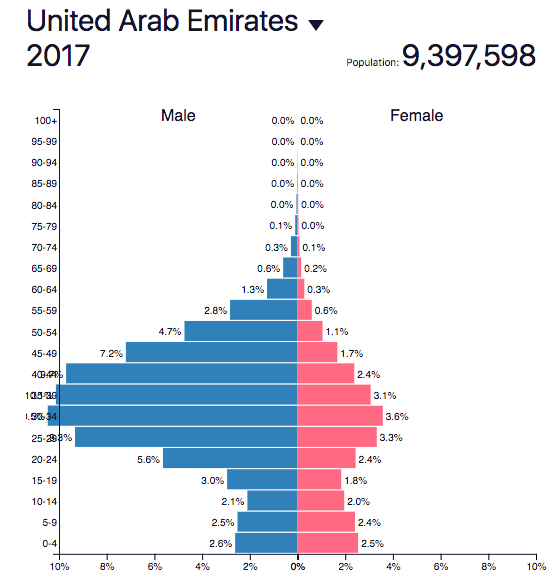 3) Examine the pyramid for the UAE below. Try to explain its unusual shape. What costs and benefits might come from this? Characteristics of each stage in birth and death rates and why. Examples of countries at each stage and why. Which areas of the world are at Stage 5? Why? Can you suggest any places on the planet which are still at stage 1? Why is this a difficult task? Where would you place the world on the model? Justify your answer.